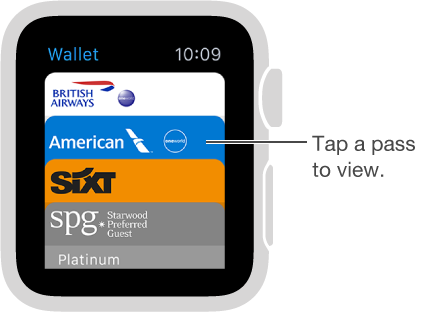 The Wallet app on Apple Watch can keep your passes, including boarding passes, tickets, rewards passes, and more all in one place. Passes in Wallet on iPhone automatically sync to Apple Watch (if you’ve turned on Mirror iPhone in the Apple Watch app). Scan a pass on Apple Watch to check in for a flight, get into a movie, or redeem a coupon. To set options for your passes on Apple Watch, open the Apple Watch app on iPhone, tap My Watch, then tap Wallet & Apple Pay. Add a pass. Follow the instructions in the email sent by the issuer, open their app, or tap Add in the notification. Use a pass. If a notification for a pass appears on Apple Watch, tap the notification to display the pass. You might have to scroll to get to the barcode. Or open Wallet , select the pass, then present the barcode to the scanner. Rearrange passes. On iPhone, open the Wallet app, and drag to rearrange passes. The new order will be reflected on Apple Watch. Done with a pass? Delete the pass on iPhone. Open the Wallet app, tap the pass, tap , then tap Delete.